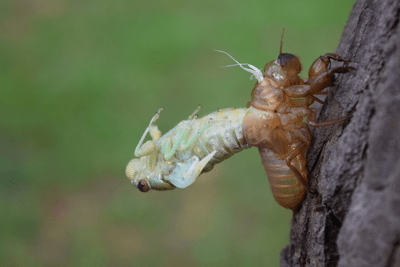 Rid your property of cicadas by calling Flatliners Pest Control in Las Vegas, NV. Most people know the bug as a summertime nuisance, but a cicada infestation can cause severe and year-round damage to your lawn. We’re here to help. Cicadas are large, flying insects (2.5 to 3 inches long) that emerge from the ground by the tens of thousands each summer. They famously have a 13- to 17-year life cycle, although some species mature in 2-5 years. It’s the males that get the most attention, making a loud, distinctive buzz as a mating call. Female cicadas and cicada larvae, however, are the real threat to your garden. Females lay their eggs inside the branches of trees and shrubs. Once they hatch, larvae burrow into the ground where they feed on plant roots. Cicada control focuses on these vulnerable plants, killing the bugs and eggs already present and protecting them from being targeted by females in the future. They harm young trees and shrubs. The larvae stunt the growth of plants. Their size and number are annoying to most, scary to others. You can trust Flatliners Pest Control as your cicada exterminator. Our pest control experts only use high-quality products that get the job done. We want to earn your business by solving your problems and keeping pests under control for weeks at a time. All of our products are also safe for children, pets, and the environment. Want the best cicada exterminator in Las Vegas? Call us at Flatliners Pest Control today to schedule your pest control assessment. We’ll provide a free quote after assessing your property. We don’t believe in long-term commitments either. We offer month-to-month contracts to all of our customers. It’s simple terms at reasonable rates. If you have any questions about cicada removal or any of our other services, give us a call or contact us using our online form. We look forward to helping you.